The Professional Record Standards Body (PRSB) is conducting this survey to help define a core set of information about a person that needs to be shared to support safe, high quality joined-up care and help people take greater control of their health and care. Making sure that the right information is available whenever and wherever it is needed for care means information needs to be recorded in a standardised way. Standards enable digital systems to share information without losing or changing its meaning. Not all information will be used all the time and a professional's access will be determined by their role and need. PRSB has produced a model, a description of what core information contains, and a set of FAQs to answer your questions about this and other related issues. PRSB has been commissioned by NHS England to define a core information standard for local health and care records, which will be piloted before roll-out across the UK. The draft standard in this survey has been developed following consultation with patients, carers and other citizens, health and care professionals and industry representatives. We would therefore be grateful if you could complete the survey and circulate widely among your networks. It should take you approximately 15 minutes to answer the questions. The closing date for responding is 30 April 2019. Following the consultation, responses will be analysed to create a final draft standard which will be assured by the PRSB and then shared with patient groups, health and care professional bodies and others to gain their support and endorsement prior to publication. Should you have any questions, please contact info@theprsb.org. Thank you for your time and interest in helping us with this project. 1. Please tell us which of the following best matches your role. Please tick the appropriate job description and add more detail in the box provided below about your specific role. Please tell us your specific role e.g. renal nurse or your role if not listed above. 2. Please describe the setting in which you work. 3. Do you agree that sharing core information will bring these benefits? 4. What concerns do you have about sharing core information? 5. Which of the following benefits would people who use services get from contributing to the information held in their health and care records? For example recording their needs, values and preferences or measurements they have taken such as blood pressure. 6. Can you see any issues arising as a result of people who use services contributing to and sharing their information? Here is a summary of the key information included in the core information standard (the full details can be found in an interactive model here). Please rate how important this information is to you. Think about what information it would be helpful to know that you can’t currently access. Important information about the person and their needs and preferences. The person’s demographic and contact details. E.g. household and lifestyle factors. Relevant illness in family, e.g. genetic information. The significant medical, surgical and mental health history. Pregnancy status and due date. Details of concerns, risks or issues e.g. presence of child protection plan. Medications, known allergies and adverse reactions. Summary of the problems, diagnoses (or symptoms) and procedures. For professionals and the person, including investigations and treatments. Children’s developmental skills, for example, walks independently. The research study/trial and or drug/intervention. Highly visible note on for example metallic implants or MRSA. Between professionals and/or with the person. 8. What, if anything, is missing from the list above? ‘About me’ section for the person using services. This section is a record of the things that an individual feels it is important to communicate about their needs, strengths, values and preferences to others providing support and care. This table shows the information captured in this section. Should "About me' be prioritised as part of the core information for everyone involved in health and care? This section is for any significant information meriting a specific and highly visible warning to any user (e.g. metallic implant, emergency keyholder information, potential dangerous pet). Should alerts (e.g. metallic implant, dangerous dogs) be flagged as part of the core information set? This section is for documenting assessment scales such as mental health assessment scales, New York Heart Failure, Activities of Daily Living (ADL). Should assessment summaries (which include written assessment outcomes for social care and mental health) be included in the core information set? Details of any risk a person poses to self, others or from others. This subsection is called risks. 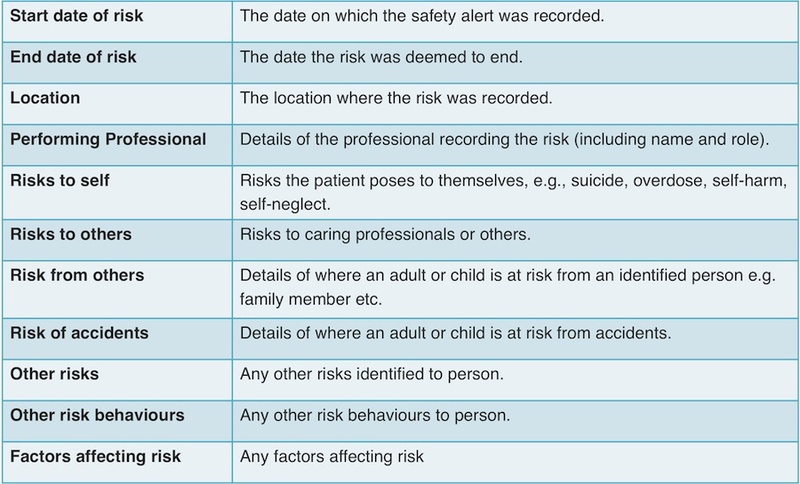 Does 'risks' describe this section well and is this what you would expect to see in it? The record of the person’s significant medical, surgical and mental health history. Including relevant previous diagnoses, problems and issues, procedures, investigations, specific anaesthesia issues, etc (with obstetric history). 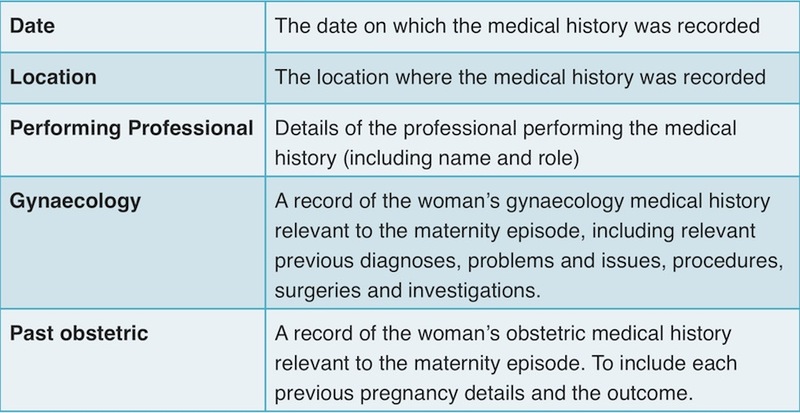 Looking at the information below, is this all the information you need to share as part of the core information set about an individual's past pregnancy history? The pregnancy state relating to women. Should current pregnancy status be part of the core information set? This is a section where any correspondence relating to the person can be stored. Should the core information set include correspondence such as outpatient letters or letters from patients? 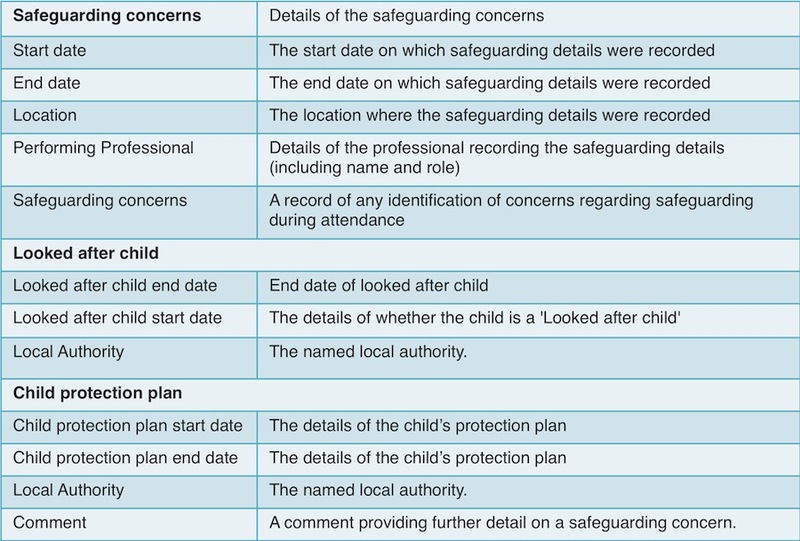 The following table of information is taken from the safeguarding and risks section of the core information standard. 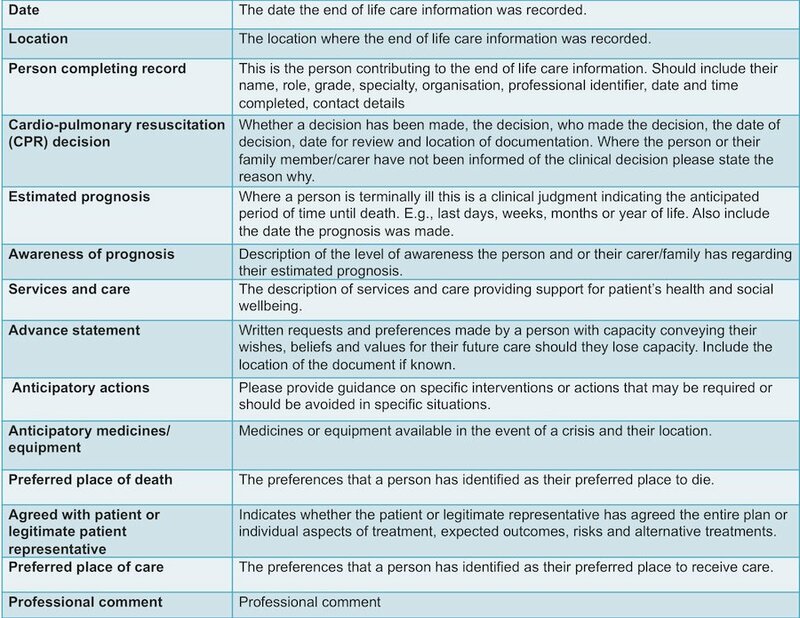 This is the 'End of life' section in the draft core information standard. Please read through the contents and answer the question below. Is this all the information needed for end of life care as part of the core information set? 19. Do you have any other comments you would like to add before submitting the survey? Many thanks for your valued input. It you would like to receive the results of the survey, please let us know by emailing info@theprsb.org.